Maktub Again ......The Black Wall? I have a strange question......Have you crossed paths with anything to do with a black wall with hieroglyphs pertaining to the 18th dynasty...showing something pertaining to Ay? The reason I ask is that every time...EVERYTIME....I go into Thagirion, I am taken by Belphegor to Egypt where I view Ay.....it is over and over again. I first see this black wall with writing but I cannot see enough of it to tell what it is saying. I always see Ay standing in a temple late at night. A few times I see him at the lead in a group of priests going into a ritual. I am beginning to feel that Belphegor was a controlling factor in the life time of Ay both through his reign of influence before becoming ruler as well as during his reign. Is there anything you can tell me of this connection as there is nothing I find from outside writings of this connection. This has become a fascination for me as I watch this ruler in the shadows of night move about. Any info you can give is greatly appreciated as I know you are an expert in finding things others never get the opportunity to experience. Thanks in advance for any help in this area. Re: Maktub Again ......The Black Wall? I have come across a few walls of hieroglyphs made of black stone while in Egypt. They are uncommon but they definitely exist. I was investigating them several years back as it seems that they have a connection with the Asetians when they used them for their energy technology in ways that remain unknown to us. 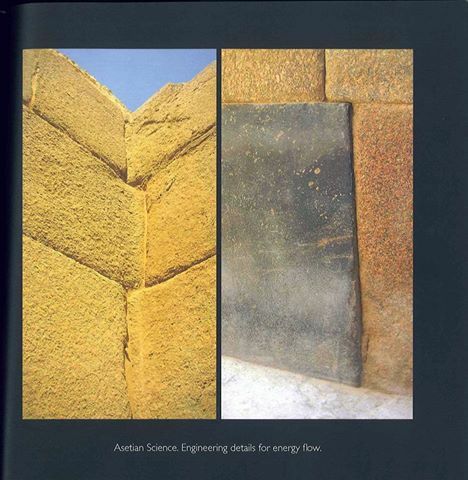 In some cases they also used polished black stone without hieroglyphs of a kind that doesn't exist anywhere near the construction site but was then placed in precise locations of temples to attain the energy effects I was describing. There is photographic evidence of this in the book Kemet published by the Aset Ka, however they noticeably kept such details and relevance to a minimum which is understandable while dropping us a hint at the same time. Now the thing is that most of those walls are much older than the 18th dynasty you mentioned so I am not sure what exactly you're referring to. However, I believe that there is relevance to Ay which you mentioned. As one of the last pharaohs of the 18th dynasty, he followed Tutankhamun on the rule of Egypt and some believe he was related with the intrigues of power known from such period of change. We know the throne was shifting from ROS control to AK control back then when the Asetians took it by force from the hands of Akhenaten. Now for which side Ay conspired it's not fully known. Some Egyptologists believe Ankhesenamun to have been one of his wives and so scholars of Asetianism defend she was involved in the plot but I don't believe that. Ankhesenamun is one of those that is relatively safe to assume to be Asetian or at the very least fighting for the Aset Ka and her previous relationship with Tutankhamun is much more well established. Now this leads us to wonder about Neferneferuaten, the female pharaoh of that period at such precise time of change. But I will not go there, although I leave it for you to investigate. Fantastic info. I appreciate this so much. It helps me confirm what I was being shown. I also understand about the black stone better. I have seen that it was being used as both contact with other dimensions as well as a protective weapon. This may well have helped create a portal into other dimensions just as one uses the mirror or black mirror to see into and also to enter into. You do not realize what this means to me with your info and feedback..
PS...the energy that is created by a group near that black surface that focused on the build up of energy and transferred , was then directed into and given to one person or being that then directed it into the specific target or enemy. It also was used to help an individual in assistance in elevating their personal energy vibration while moving in etheric places and increase their frequency. I believe that certain individuals were chosen because of their higher spiritual attunement to work in this very operation. Your information has certainly helped me to understand what I was seeing. It seems that the waiting was fruitful as we privately discussed Maxx. Thank you Maktub. Much Asetian technology is still lost in Egypt, hidden beneath the sand. If you want my opinion, some of it is better to remain that way as the world isn't ready to have access to such powers. Humanity is already irresponsible enough with the small bit of power it has. I am sorry about my answer post. It did not dawn on me until after I had posted and could not take it back that because of my excitement regarding confirmation of what I have seen it had gotten the better of me. I posted without thinking. If need to remove I second the motion. It is very important for me to confirm the things which I am involved with but I think I posted a couple of things that should be removed. Maktub and Victor.....thanks to both of you. Glad I got to read that before it is potentially removed. The modern insight into ancient culture is fascinating and makes you wonder what kind of metaphysical power the Aset Ka had an developed during their time in the physical realm. I understand your excitement Maxx and see nothing wrong with your posts in this thread. When I mentioned that some secrets are better to remain hidden I was talking about the advanced magick concerning some of those Asetian constructions in Egypt under discussion, but you and Maktub talked about it in a positive way without leaving practical details that could be misused by those who watch us around here. It is my understanding that those seeking to make disrespectful use of Asetian esoteric technology will probably not even understand what you were talking about. For you fellows who don't like to read a lot, or who don't want to click the link the article talks about setting up a crystal grid to amplify energy. I will only put up the site address on this video because if I place the video up, it will eventually be removed because of copyrite problems.....so I only list the connect site on youtube. But this 2 hour video has some very, very interesting comments about what Maktub commented on regarding some of the rulers of that time. Both about the rulers of the 18th dynasty with pictures of their skulls showing a connection to another element......as well as some comments about the ammonites being giant "vampires". Disregard the freaky person that appears to have smoked too much you know what in his life.....but anyway....you might find much info in this connecting to many different subjects. BTW....not all of this info is presented in order. As most of these presenters do, they put many things together in short segments to try and justify their position and when that is done, you will be well aware that the final conclusion is incorrect....but some of this info is interesting in itself. Of course, too much biblical stats to prove a point so take it tongue in cheek....lol. Thanks Maxx. I'll keep the tongue in cheek in mind. and at the end you will see the author is the guy that broke into the house of the preacher seen in the videos here in another section named Mike Murdock....(My favorite clown preacher) and stole his 600 pound safe....lol......and my assessment of smoking weed is pretty accurate here......but again, there are some very interesting topics that are presented. Maxx, do you have a copy of "Kemet - The Year of Revelation" published by the Aset Ka in 2009? They feature a photograph of exactly that kind of strange black stones. I believe it's titled "Asetian Science". There's definitely relevance there. I looked to buy one but it was sold out at the time. Just never followed up on finding one. I have not gone back to visit Ay lately as I am engrossed with the study of everything from daylight to midnight. "Somethin' gotta hold of me" lol. But I will make an attempt to find the book. Thanks. sensitivity have been able to detect me viewing them and are aware that I am from some other time span. I have even found a couple of other people that have said the same thing. And that is for certain bringing up my questions I seek to find answers for. One of those is the element of free will. It now appears to me that free will is only occurring BEFORE we enter into our present life. After being born all of our movements throughout are pre-designed and we experience them. There are many things I am working on at present. Jonathan wrote: Maxx, do you have a copy of "Kemet - The Year of Revelation" published by the Aset Ka in 2009? They feature a photograph of exactly that kind of strange black stones. I believe it's titled "Asetian Science". There's definitely relevance there. Are there other pictures in that book besides this one? Wasn't diorite used quite often in funeral rituals ? Maxx, there are other images in the book using the same black stone but in statues and wall engravings I think, however that one you showed is the one you should be looking for and the one I believe Maktub was referring to. Those are the structures connected to metaphysics and energy.